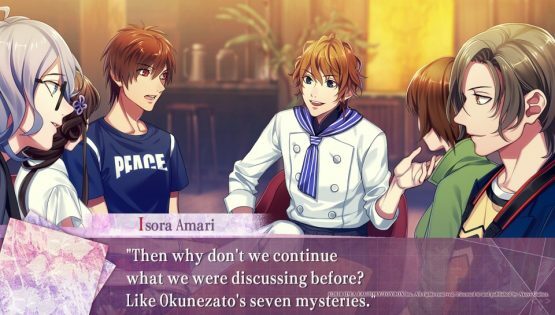 7’scarlet is the second of three otome visual novels releasing for Vita in what Aksys Games calls their “Summer of Mystery.” I was already a bit worried that three otome visual novels releasing back-to-back with the same companies behind the wheel would be too similar to one another to really make an impact. How many different ways can you tell summer mystery stories with one girl picking between five guys? Then the opening sequence featured a man chasing a girl, telling her she can’t beg for her life because she has none. I hung my head for a couple of seconds. Was this really going to be just like Psychedelica of the Black Butterfly? Is this another story of a group of dead teenagers trying to come back to life? Between Black Butterfly and Bad Apple Wars, I’ve had my fill of that tune for a little while. Fortunately, my assumption was dead wrong, and leading me to voraciously read through all seven main endings (and five normal endings) in about two days. Like a good paperback, I could not put it down. I had to learn everything there is to know about the town of Okunezato, these characters, and the truth about the disappearance of Ichiko’s brother. All I can say is that I couldn’t (and still can’t) handle the truth. Our heroine of this story is Ichiko Hanamaki, who is talked into visiting the remote country town of Okunezato by her childhood friend, Hino. Hino frequently visits a website regarding the supernatural activities of Okunezato, and a few of the members suggested a meet-up over the summer. Coincidentally, Ichiko’s brother mysteriously disappeared in Okunezato, and they’ve never found his body or learned what happened to him. Seems like a perfect opportunity to mix summer fun with old fashioned detective work. Naturally, almost everyone who came to the meet-up is a boy. It wouldn’t be an otome if it didn’t have at least five eligible bachelors ripe for the picking. And most of these boys are ready to tell her immediately just how eligible they are, which cranked up the creep factor to 11. The chef there? He’s the creepiest of them all. I felt dirty his entire route. Don’t get me wrong; I know what otome entails. One girl, five guys. Typically each guy has a very unique personality, and at least one of them is over-the-top enough in his instant love pledges to be creepy. However, I haven’t read one where a majority of them and one other NPC were practically climbing on top of one another to get her attention. It reminded me of the first Twilight novel (Yes, I read it, shut up. Don’t judge me. ), where on Bella’s first day at her new school, nearly every guy she talked to asked her out. That may be every low self-esteem teenage girl’s dream, but it’s unrealistic to the point of annoyance. As sweet as some of these romances are, they’re almost preemptively killed by these boys drooling all over her like they’ve never seen a girl before. That said, though, not all of these romance paths are automatically open at the beginning. Only two are, and the rest unlock one at a time after completing those first two. It’s very easy to wrap up the summer romance after completing one route, but 7’sCarlet knows how to get you running through the next. It’s not a matter of wanting to check out the other romance options, although that is some motivation in of itself. You may be completely happy with a particular Happy Ending, but after the credits roll, the game teases you with a bit more information about the Okunezato memories. With a couple of these teases, I had completely forgotten that this particular thing still wasn’t resolved. That’s part of the beauty of 7’scarlet—you’ll never understand or solve the mysteries without seeing every Happy Ending. Each character route expands upon information revealed in the previous Happy Ending. It’s rather brilliant. Seeing the Final Ending wraps all of it up quite well, yet, much like Psychedelica of the Black Butterfly, the true ending or best ending isn’t entirely the happiest or the most romantic. It may not even be your favorite ending. For me, the Final Ending was the absolute worst one. At the same time, I see the logic and brilliance behind it. If you’re looking for a visual novel that has more to do than “press X to choose,” then go on ahead and pass 7’sCarlet by. While I believe that incorporating in extra gameplay mechanics can enhance a visual novel, it can also just as easily hinder the experience. 7’sCarlet doesn’t have anything extra outside of choosing dialogue options, but anything else would take away from underlying stories. It may not have the most exciting gameplay, even for a visual novel, but it fits the aesthetic perfectly. It’s really hard to get into anything else about 7’scarlet without getting into spoiler territory. I will say that while it has a couple of predictable elements, every other revelation blew me away. I may not have liked how it all ended, but I enjoyed nearly every step of the journey to get there. Really, that’s all one can really ask from a visual novel, especially otome. 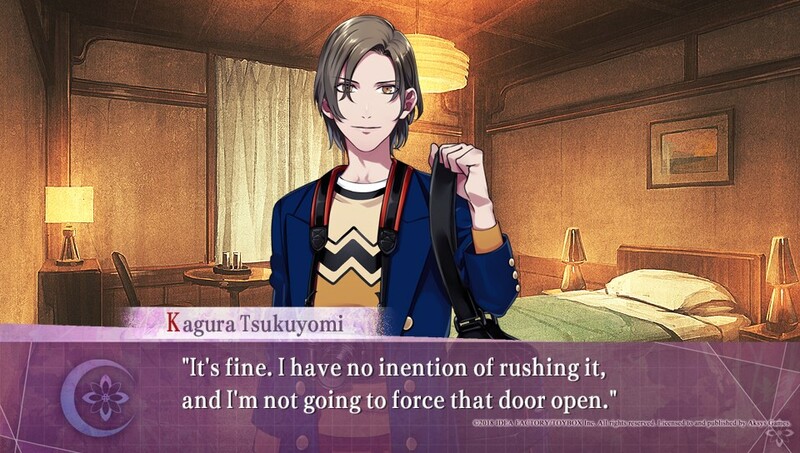 Otome visual novels are typically eye-candy, and there’s nothing wrong with loving a super sickeningly sweet romance. But those otome that go beyond the eye-candy and force you to think are the ones that will stick with you forever, even if you didn’t like how it ended. 7’scarlet falls squarely in this category and does it better than most other otome try to do. 7’scarlet review code provided by publisher. Version 1.00 reviewed on a PlayStation Vita. For more information on scoring please see our Review Policy here.